Seasonal gift sets are an excellent way to boost sales year round, but inventory storage, kit assembly, packaging and distribution expenses can cut profits. Fulfillment companies can provide cost savings through economies of scale that reduce these overhead costs while maintaining product quality and timely shipments. Seasonal gift sets are packaged in a variety of ways. Most methods include hand assembly and an eye toward detail as these designer sets take care, quality and skilled hand to get them just right. Christmas, Valentines’ Day and Halloween, in that order, represent the bulk of the seasonal gift business and often include the following packaging methods: shrink wrap, cello wrap, decorator containers, boxes, bows, raffia, pasta, food, chocolate, boxes and baskets, just to name a few. Some companies opt to assemble, package and distribute products internally based on volume commitments and turnaround time. Other companies have learned to take advantage of the economy of scale offered by professional manual assembly and fulfillment companies who already have the space, packaging equipment and labor force to manage the project effectively. These firms can receive raw (or source) components, assemble it to your specifications and then distribute (drop ship) these attractive products to retail outlets. Beauty may be in the eye of the beholder, but damaged goods won’t please anyone. Outside contract packaging companies have the experience with the handling of seasonal gift sets to make sure that the gift set is packaged properly for shipping. While it is the designer’s job to make the gift set appealing, attractive and affordable, the end result can be much different. In theory, a glue dot is very functional in holding items in a gift basket together but in practice it is not. A professional contract packaging company who has experience with gift sets will collaborate with you and help you design your creative gem for “manufacturability”. This could mean adding strength and support to the gift set based on weight and size without adding too much cost. Ultimately it is a balance of a well-designed and attractive gift set with the security that the items inside the set will stay in their intended position to gain the maximum value once on a retail shelf. Shrink wrap and cello wrapped gift sets provide inexpensive, high-quality packaging for seasonal gift sets. Candy, chocolate, cosmetic, bath salts, health and beauty and hair products are a few gift set ideas that companies exploit as they can add a variety of accessories in a category to add margin to a retail gift set that might have “seconds” or slow moving items included which don’t sell well on their own. This “more is less” approach bodes well for a manufacturer who has a broad product offering and wants to represent the complete line to the consumer. This can be done thru creative gift set packaging. Cosmetics, arts and crafts sets, personal hygiene kits, home & garden, and many more seasonal gift sets look their best while maintaining product quality in attractive boxes designed specifically for your product lines. Effective POP displays add greater marketability to seasonal gift sets, boosting impulse sales at any time of year. 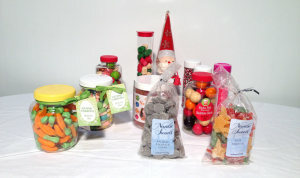 The growing trend of create-your-own gift baskets makes this an excellent market opportunity for companies of all sizes. Customers select the contents of their seasonal gift set online, choose a basket and fillers, and, with the click of a button, send their gift to family and friends around the world. When shopping at any one of the major retailers including Target, Wal-Mart, Sam’s and Costco, you will notice all year round there are gift sets available in a specific area of the store for impulse and gift buyers. Other than for the 3 major holidays, many companies create seasonal baskets for Father’s Day, Mother’s Day, 4th of July, Birthdays, Thanksgiving and others. Make the most of your seasonal gift sets with properly designed packaging, professional kit assembly, and affordable packaging and distribution today, for a better bottom line tomorrow.